Components and accessories designed to specifically fit and complement an Coyote™ pop up display. A tough, wheeled shipping case designed to ship a Coyote™ pop up. A heavy duty shipping and storage case with an access door. Convert an OCX pop up shipping case to a fabric covered podium. Convert an OCP Elite pop up shipping case to a fabric covered podium. Convert an OCX pop up shipping case to a graphic covered podium. 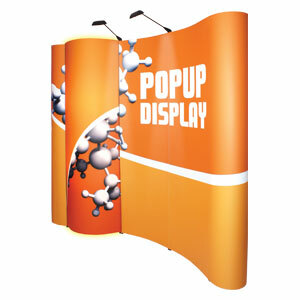 Convert an OCP Elite pop up shipping case to a graphic covered podium. A printed stretch fabric cover for an OCX pop up shipping case. A printed stretch fabric cover for an OCP Elite pop up shipping case. An internal shelf for a Coyote™ curved pop up display. Combine print and digital images to strengthen your message. A forward facing, convex panel.